On Tuesday, I completed my first semester of college. That’s weird for me to say. I still haven’t quite comprehended that I’ve moved into this season, especially because adults always talk about college as if it was the best time of their life. That’s not to say there weren’t challenges. I am so blessed to be studying English and dance, two things that I love, yet I still went through a stretch of time where it was very hard to stay motivated and get out of bed in the morning. Because of that, I’ve started to worry about the future: will I ever find something that makes me excited to get out of bed? Or will I spend my whole life looking forward to the next season as the time when I will finally find fulfillment? When my thoughts go down this path, and I start to second-guess all of my career plans, I’m learning to trust that God has a path planned for me, and that He will sustain me through the inevitable times when the daily grind weighs heavy. Homesickness is certainly real, too, and there were times throughout the semester where I was overwhelmed by how much I wanted to see my family and my dog and go to my church. Honestly, church was one of the hardest things. For the first few weeks it was fun to visit new churches, but after a while it got really stressful to have to decide on a church and find a ride there every week. I knew it was time to decide and settle in when, one Saturday night, I reached a point where I would rather have stayed home than visited another new place. Thankfully, one church easily stood out as a place that could become home, and I’ve been going there with a few of my friends ever since. Even though it’s not the same as my home church, it’s been a wonderful home away from home. It’s the only church we visited that I felt really welcomed us (that’s harder to find than you would think, which is sad). The teaching is Biblical and solid, and even though I differ slightly with them on a few issues, the community matters far more to me. Overall, I love my school. I’m blessed to go to a Christian school that is very strong in the arts, and both of those things have proved to be exactly what I need. First of all, being constantly surrounded by faith and worship has been vital for my spiritual growth. I didn’t realize how much I was missing by being at a public high school, and while I wouldn’t trade that experience, my faith was ready for this next step. Yes, maybe we’re in a bubble. But I’ve been outside of the bubble already, and being in a bubble is turning out to be a wonderful, healthy reprieve before I likely enter the public school system again as a teacher after college. Being surrounded by the arts, too, is amazing. There are constant performances and events to go to, and being able to see art done in excellence and used for the glory of God is incredible (it’s something I’m pretty passionate about, as most of you probably know). And truly, even if I did get a little tired of the daily grind by the end of the semester, I can already feel myself making so much progress. I’m glad that I have both English and dance: English comes much more easily to me, and dance forces me to push myself. I can already see my skills improving, and more importantly, my mindset has changed in some significant ways. There is a constant focus on reflection, goal setting, and self-awareness in my program, and I feel slow but sure growth happening in every area of my life. I think that’s what most defines college: growth. It’s a time for you to figure out who you really are, on your own, without your family ties. A time to grasp your faith for yourself and let that inform your daily choices. A time to change and improve and become the person you will be for the rest of your life. And the best part? Most of this happens so naturally, and I’m so excited to see who I’ve become at the end of these four years. That’s a wrap on first semester, and on this series, although I’m sure I’ll be posting more about college in the future! Let me know if that’s something you would like to see, and if so, what specifically I should write about. And if you’re in college, or applying to college, or graduated from college, share your experience in the comments! I’d love to hear. As my advisor told me the other day, learning to manage time is the single most important element for succeeding in college. And it can be overwhelming. But I’ve figured out a system that works really well, and honestly is very simple, which I’m going to share with you today. This is what I do to stay on top of everything that’s important to me. My organizational system is guided by this one major principle: immediately write everything down in one place. Get a planner. This can be physical or electronic. Every time you commit to something, schedule something, find out about a deadline, or think of something you need or want to do, write it down in there immediately. You will develop your own system for how you organize this information. But the biggest thing is to get it written down. Then, when you’re trying to plan your day, you won’t have to worry about forgetting things or having random sticky notes scattered around your dorm. It will all be there. This doesn’t mean you won’t ever forget about something or leave it to the last minute, but if you can form this one simple habit it will go a long way toward your organization. So, what does this look like in my life? I currently use a Day Designer planner. I’ve tried both paper planners and electronic ones, and while the electronic ones are more convenient in some ways, I just prefer writing things down on physical paper. I’ve also tried Erin Condren (excellent but very expensive) and Plum Paper (also really good, slightly cheaper). My planner is where I write down scheduled events, deadlines, and miscellaneous to-dos. I cheat a little bit from my own rules and actually have two places that I write things down, because I also use Powersheets, a Christian goal planner that guides you through goal-setting at the beginning of the year and then at the beginning of each month. I use this for long-term goals that don’t have set deadlines, which I then transfer into my daily to-do lists in my actual planner. First of all, at the beginning of the semester, I wrote down every single assignment or test from every syllabus on the day it was due in my planner. I definitely recommend doing this immediately; that way you don’t have to keep checking back to your syllabus if you forgot what things are due. Write down blog posts on each Saturday in my planner with my other deadlines so I remember to get them done. Write down any birthdays with my other deadlines so that I know to prepare for them. The planner I use has a schedule side and a to-do list side. I write my schedule out first, checking my calendar for anything unusual and then filling in my daily routine of classes and activities. I also fill in the times I’ll use to get ready, do devotions, eat, sleep, etc. Whatever time is left is my “to-do” time, at which point I’ll refer to the to-do list on the other side of the page. Next I make my to-do list. I start by looking an entire month ahead at all of the deadlines I have coming up, and making note of what I need to get done or start working on so that I can get it done by the deadline/due date. I like to work on things in several sittings, usually, rather than getting it all done the night before. Some people might work better in one sitting, so figure out what works for you! Once I have all of those urgent to-dos written down, if I still think I’ll have time accomplish more, I add household tasks that need to get done like laundry and cleaning. Then I go to my Powersheets and pull things from there until I have a list that fits the timeframe that I have that day. And that’s pretty much it! Sometimes I’ll put stars next to the top three things I need to get done, but I don’t always do that. It’s honestly not a complicated system but it requires diligence to stick to the schedule and the list each day, and careful thought about what my priorities are and how I’m going to use my time. Time management is actually one of my favorite things to talk about, so let me know if you have other questions or want to see more on this, or even want to hear more about the philosophy of time management from a Christian perspective! I know my posts have been getting more practical and less spiritual lately, but there’s still plenty of spiritual content coming. I wanted this series to be helpful in a variety of areas for people who are going to college soon, so stay tuned for more of both practical and spiritual advice, and share in the comments how you manage your time! One of the things I was most looking forward to about college was the chance to start over socially. I’m at a small college far away from home, and so I didn’t know a single person going in, except my roommate, and we had only met in person once. I had heard that the social situation in college is much different than high school, and it definitely was, especially for the first few weeks. My biggest advice for the beginning of college is to go to as many activities and events as possible. At the beginning, there will likely be a lot of things going on to help freshmen get settled in, so take advantage of that. Even though I’m the type of person who tends to want to stay at home, I pushed myself to go to those kinds of things right away. I found that if I put myself out there and did things, it was very easy to meet people. With everyone trying to find friends, there’s an environment of openness and inclusion that is very cool. Something else I didn’t expect is how close you can become with people after a very short period of time. My roommate and I felt like best friends after only a few days. And in five weeks I’ve already had some incredibly deep and vulnerable conversations with people. Late nights, especially, are breeding grounds for good conversation with random people in the lobby of your dorm. And it’s true that there will be some people who you click with more than others. Find those people who you really enjoy talking to and being around, and then spend as much time with them as possible right away, before your classes get really busy. If you can establish a few promising friendships immediately, they will maintain themselves as schedules get crazy, and you will have those people to fall back on if things go wrong or you need support. Then you can expand your social life from there as the semester goes on. And it is important to continue expanding your friend group! I found those few close friends right away, and a group of us formed who have been spending a lot of time together. It’s easy for me to stick with the same people; it’s comfortable and validating to have a “group”. But I’m working to make sure I don’t get too set in my clique. I want to meet a wide variety of people, and I want our group to be welcoming of others. So I’m starting to make an effort to sit with different people at meals and talk with people I don’t know as well, while still balancing time with the friendships I’ve already developed. As we settle into the semester, the biggest struggle for me is how much I want to feel included and liked. I have to constantly remind myself that it isn’t my goal to be liked by others, but to bless others. I shouldn’t be trying to make sure I feel welcomed and included, but trying to make others feel welcomed and included, showing everyone love as fellow image-bearers of God. Ultimately, friendships are a beautiful gift from God. Creating new relationships takes patience and trust, but if I walk in faith, seeking to follow His design for how I interact with fellow humans, those relationships will develop with time. I’ve been so blessed already and I can’t wait to continue to grow in my relationships with all of the new people in my life. How have you made friends in a new situation? Move-in day: probably one of the most iconic and also most stressful days of freshman year. A few weeks ago, I had mine, transitioning my whole life to a little college in Mississippi. I’ve gotten settled in and learned a lot along the way, and I want to share some of that with you today. Two: Bring a board game or card game or something. It will be fun to share in social situations. You might think you won’t use it – you actually will. Three: Make a to-do list for the day! The day I moved in, there was so much going on, so many little things that needed to get done, and I tried to keep it all in my head. Not a good strategy. Write down anything that you think of; that way you can focus on one thing at a time without worrying about forgetting things. Four: I have my bed raised pretty high off the ground, and I made a little nook underneath it with a rug and a bunch of pillows. It’s such a nice place to sit and study, it’s where I do my devotions, etc. I would recommend it! Five: Use your first few days to get the lay of the land. Figure out where your classes are and where other things are on campus that you might need. Check your mail. Find the library. Etc. Six: Try not to stay up ridiculously late right away. It’s not summer camp, even though it might feel like it – you have to maintain your life for a whole semester. Especially if you like your roommate, it feels like a sleepover initially. It’s okay to enjoy some of that, but try not to go too crazy. It’s okay for things to be a mess. In general, I’m a very organized person. I like things to be neat and nice, everything in its proper place, easy to keep track of. But since I got to college, I’ve had less and less time to clean and organize. There’s not a lot of surface space in my dorm, so everything gets piled on the desk most of the time. And I’m learning to be okay with that. Here’s the thing: life is not about cleanliness. Life is about the pursuit of God, and living each day in light of eternity. To put it bluntly, organization for its own sake is pointless and a waste of time. Yes, God is a God of order, and we are called to be good stewards of the possessions He has given us. But taken to extremes, the pursuit of organization can become a distraction from better and more important things. Everything we do in our lives should be for the sake of the kingdom of God, and so the only reason to clean and do laundry and other things of that nature is so that the disorder won’t hinder our kingdom work. If it’s a little bit messy, that’s okay. Maybe your time would be better spent reading your Bible, or ministering to a friend who needs encouragement, or pouring yourself into the local church. It comes down to priorities. What is in our hearts? Are we making organization an idol? Or is it one more means to the ultimate end of seeking God’s glory throughout our whole lives? As I’m getting settled into college, I’m realizing more and more that I don’t have the time to make sure my dorm always looks perfect. There are bigger and better things happening that need my care and attention. As long as I can continue living, the mess is okay. Do you make organization an idol? How are you learning to embrace the mess in everyday life? If you’re in college, what move-in tips do you have? I graduated from high school on Wednesday. As I sat down to write the first draft of this post, I had no idea what I wanted to say about that. It definitely hasn’t sunk in yet, and I’ve barely had an emotional reaction. I keep telling myself that I never have to go back to another day of high school, and yet my heart hasn’t absorbed the news. Basically, I feel exactly the same. I guess we all expect these milestones to feel incredible, to cause an immediate, major change in our lives. My sister told me I needed to start dressing more like a college student, and I was like…what does that even mean? I’m still the same person, and how I dress isn’t going to change overnight because I’m handed a diploma. I still struggle with the same things, like and dislike the same things, wake up and do the same things every day. Yes, graduation is a huge milestone. And once we get to the fall, everything in my daily life will look different. But this week, I still had to wake up on Thursday and continue living my life. That’s certainly not to say that high school hasn’t changed me. This week has provided an opportunity to look back and marvel at how far God has brought me. While I might not have changed from Wednesday to Thursday, I’ve definitely grown from freshman year to senior year, becoming more confident in myself, watching relationships develop and grow into friendships that I hope will last my whole life, pursuing my goals and seeing God richly bless that pursuit. I haven’t changed into a different person. I’ve grown into myself. And of course, there are many ways I still need to grow, and so this week has also been a time to look forward and think about how best to serve God in my future. Thinking about all of the experiences I’ve had and things I’ve accomplished in the last four years, it’s mind-boggling to realize how much more is probably ahead in the next four, as yet unknown. Graduation isn’t just an ending, certainly. But I wouldn’t really call it a beginning, either – it’s just part of the middle, another stepping stone on the journey of life. Because a few days later, I’m still just living my life, one day at a time, seeking God’s will at every new turn. What do you think? 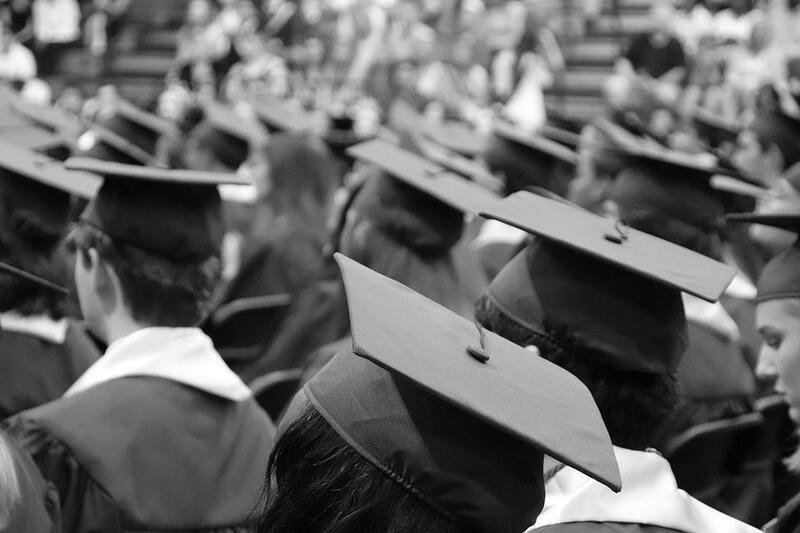 Have you been through a graduation yet, and if so, was your experience similar to mine? Share in the comments! Over the past year or so, I’ve been going through one of the most notorious experiences of the high school years: college applications. Those two words strike terror into the souls of teenagers everywhere. But today, I’m here to say that I have survived the process. I know where I am going to college, and I have seen God work through the entire process in an incredible way. You may remember that I wrote a post about being deferred from Princeton back in December. I talked about how much I wanted to go there, but how God was telling me that I needed to learn to trust him first. After that deferral came, I started looking at other options. There was this other school I had been considering, a very small Christian school in the heart of the South, that had a great dance program. In January, I headed down to that school with my dad, to visit and audition. Then things began to fall into place. I was offered a large academic scholarship. I met a super sweet girl at the audition who was willing to be roommates. I received an acceptance letter from the dance department, which was probably one of the most exciting days of my life. Not only that, but the dance department offered me a scholarship too. Suddenly the prospect of being rejected from Princeton didn’t seem so bad. So when the rejection came, I didn’t even care anymore. I had found my dream school on that tiny Southern campus, and they had accepted me. Ultimately, it was a decision I barely even had to think about. Looking back, I can see God’s timing so clearly. In December, my desire to go to Princeton was so strong that a rejection would have been devastating. The deferral, while not what I wanted, kept my hope and my spirits up. Before I would be okay with a rejection from my supposed dream school, I needed to fall in love with another school, see that there was a better option, and feel God’s guidance leading me there. It was an amazing weekend. I will always cherish those memories. But it was only that, a weekend, and I’m okay with that. Going to college there? That wasn’t the best path for me, and I’m beyond excited to be going where I’m going. It’s not prestigious or well-known. But that’s okay, because it’s the right school for me. So for those of you who are just beginning this process: it’s going to be okay. It’s not really as hard as everyone makes it sound, and God will see you through. I’ll repeat what I said in my Princeton post: His plans, they are always better than anything we could ever imagine. I’ve seen that come so completely true in my own life, and I pray that you will see it happen in yours as well. Whether it’s college, a job, a relationship, or anything else that comes with growing up, He’s got it. Just trust. He saw me through. I’m almost a college student now, and that’s the most exciting thing ever. Have you gone through this process yet? What plans do you have for after high school? How have you seen God work His purposes in your life? Share in the comments!